Subaru BRZ is the perfect machine for an enthusiast. It isn’t too expensive, neither is it impractical. It has a perfectly balanced chassis, rear-wheel drive and a manual gearbox. Throw in the right amount of horsepower and the rear will lose traction at your command. But, Subaru also make the Impreza STI. So, what will happen if the BRZ gets STI-ed. It’s a question that should be troubling all car lovers. Happily, Subaru themselves thought they would address it and brought a BRZ STI Performance Concept to the New York Auto Show. The 2015 Subaru BRZ STI Performance concept features enhanced chassis, intake and exhaust systems. STI has also made changes to the exterior in order to achieve better aerodynamic performance, while the engine is based on a racing engine from Super GT-spec BRZ. The concept is a showcase of the levels of sophistication the guys at STI can achieve and it clearly shows that a BRZ STI road car is possible. Subaru however refrained from making any such announcement. Subaru America might surprise automobile fans with a new concept this New York Auto Show. If the car in this leaked image is real, then we could be looking at a Subaru BRZ STI- a more powerful and sportier version of the standard BRZ. I mean, that’s what the world needs at this moment- a good driver’s car made better in all way possible. From the image it seems that it could be based on the BRZ. The low chin and that large air intake, wide haunches and classic Subaru style oversize rear spoiler makes up an exciting visual package. The BRZ was all about keeping things simple. The same could be true for the alleged Subaru BRZ STI. An uprated boxer engine in the front and rear wheel drive with an old fashion stick shift and bucket loads of fun. New York, N.Y. – Subaru of America, Inc. today unveiled the STI Performance Concept at the New York International Auto Show. The STI Performance Concept signifies a plan for U.S.-expansion of Subaru Tecnica International (STI), the performance division of Subaru, in its three core business areas; aftermarket parts, STI-tuned cars and motorsports. The expansion has already begun, with STI-engineered parts replacing Subaru Performance Tuning (SPT) aftermarket parts in the U.S. market, and with STI’s increasing engineering presence in Subaru of America’s Global RallyCross team. In the future, further models tuned by STI will be available in the US. 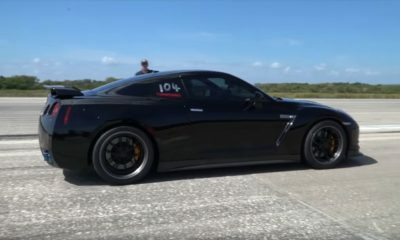 These cars could feature more extensive modifications from the factory than previously offered, such as suspension, performance, braking, chassis and aerodynamic upgrades. The STI Performance Concept is a showcase for the engineering prowess and tuning capability of STI, featuring the racing engine developed by STI for the BRZ Super GT racecar, suspension and chassis components and aerodynamic upgrades. Complete cars (extensive tuning by STI) and performance parts available now in Japan focus on the WRX STI, Forester and BRZ models. The Japanese domestic market uses the nomenclature “S model” as its naming for the WRX STI and uses “tS” on BRZ and Forester vehicles that have STI components, but a naming convention for any future US models has not yet been established. STI was founded as Subaru parent company Fuji Heavy Industries’ motor sports division in 1988. In 1989, a first-generation Subaru Legacy, tuned by STI, broke the FIA-certified world speed record over 100,000 kilometers. From there, STI moved on to the World Rally Championship, winning 3 constructors championships and 3 driver championships for Colin McRae, Richard Burns and Petter Solberg. It currently competes in the Nurburgring 24 Hour Challenge race winning its class two times in 2011 and 2012 and also in the Super GT series with its BRZ-based Super GT.